December 9th was a really exciting day for us as we were able to start work on our field. A section of hedgerow needed to be removed in order to make an entrance for the machinery that will start putting in the infrastructure on site, which is due to start in spring 2017, and in the winter months there would be no problem with disturbing nesting birds. We are mindful that this may affect other local wildlife species, and because dormice may be active in nearby woodland on Allington Hill, we enlisted the help of ecologist Bronwen Bruce of Abbas Ecology to look for signs of them hibernating. Although no dormice were found on the day Bronwen help us put up four special dormouse nestboxes which we had purchased, so that in the spring they will provide safe places for the dormice to build nests and, hopefully, breed. We are very keen to develop the site with a view to sustainable living; and creating even more biodiversity around our living spaces is important to us – ponds and native tree planting will create more habitats and we plan to actively manage our hedgerows and trees to create the right environment for these beautiful and elusive creatures. 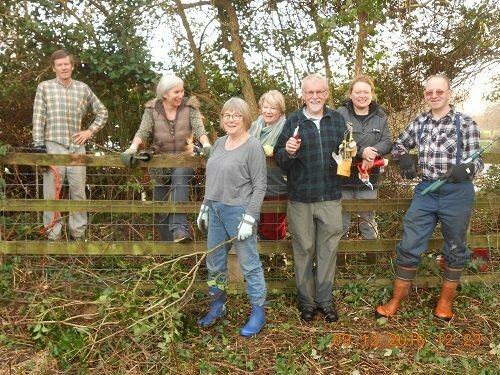 Members worked really hard, with the help of our mangement consultant Charles Couzens ( wielding chainsaw) to achieve the breakthrough and we were pleased that prospective member Alison and newest members Emily and Herbie gave a helping hand just when we needed it.